Dark Schneider is the most powerful sorcerer in the world, which he almost completely took over before being imprisoned in the body of a little boy by Grand (or Great) Priest Geo. Rushe is soft spoken and had a crush on Yoko, which carried over to Dark Schneider. Rushe and Dark Schneider share the same soul, which means they love what each other loves, but that is where it ends: Dark Schneider can be incredibly evil, heartless and lecherous, whereas Rushe is faithful, quiet and friendly. Dark Schneider is immortal (though whether this is conferred upon Rushe is unclear) - he can resurrect himself through willpower alone. In the English version, he is also called the Mage of Fire, and, in the Japanese, The Exploder Wizard. 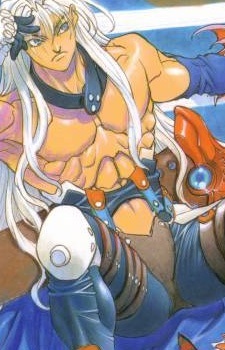 Whenever Rushe is kissed by Yoko, Dark Schneider is released, and when Dark Schneider is kissed, Rushe is released, and so on, though Dark Schneider can break the seal himself when extremely angry, and he can control Lushe's body at certain times of night (re-gaining his powers for a while in the process). (Source: Wikipedia) "Schneider" is German for "tailor," so his name can be translated as "Dark Tailor"; this seems appropriate, as he can seemingly conjure clothing out of nowhere. His name is a reference to the vocalist of German metal band U.D.O., Udo Dirkschneider. The spell that releases Dark Schneider, "Accept", is a reference to Accept, Udo's former band.